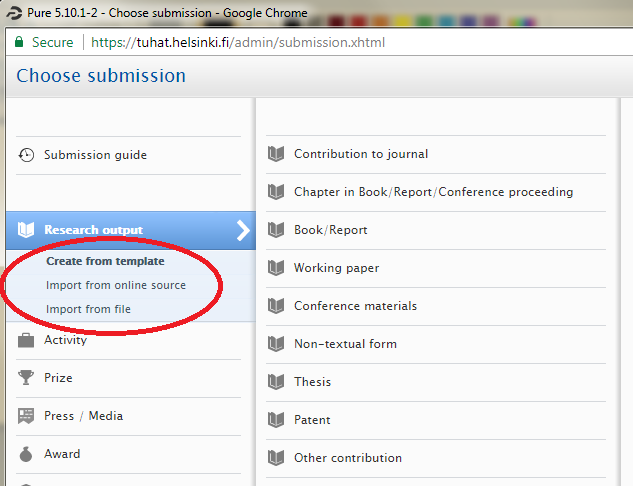 Help texts in the submission forms, click the icon to keep the texts visible. Other contracts are synchronized after the contract has beemn submitted to HR system ( emeriti professors, docents, visiting scholars and grant scholars). Researchers working at HUS can apply access privileges via HUS-intra or Terkkko. HUS personnel only need personal user access to enable publication synchronisation to ORCID (Orcid.org; guide). New user? Please see more information here. Problems with University of Helsinki username? Go to self-service. Contact tuhat-info at helsinki.fi, phone 02941 22000. In Tuhat-system, content can be submitted in Finnish, Swedish and English. Portal shows content as it is submitted in Finnish, Swedish and/or English. After log in, click your user name in top black bar, to set your language preferences. Current information from the assessment office is available in this Yammer group: Research Assessment, latest information regarding schedule and data in this post. It is recommended that you update your Tuhat information from years 2012-2017; your personal profile, projects and their funding, publications, activities and press/media. Tuhat Impact data is not used. A person can add publications and other related content, modify personal information and have own page in the research portal. Affiliated organisations, period and job title (job description field can be modified). Default publishing name = system uses this name in all content related to person, e.g. research output, activities, projects. In the new portal titles are shown right below your name. Please add titles as you best see. Please add your education to Education/ Qualification section. Your university title will be visible with your affiliation information. Postnominal title. This is shown in the portal after your name. Title. General title type, most commonly used. (Previously this section had synchronized information on Education and career phase. This synchronized information has now been removed, but any data submitted by yourself still remains. Education should be moved to new section Education /Qualification). Here you can automatically see your University HR number and student number if applicable. To add Web of Science Researcher ID and Scopus Author ID, click Add ID. ORCID is a persistent identifier. Read more at https://orcid.org, researcheridentifier.fi/ or watch these videos. The University of Helsinki encourages researchers to register for an ORCID and to use it in all web presence, including grant and manuscript submissions, blogs, homepages etc. ORCID is also a research portal that can collect your scientific activities from various sources. Click Create or connect your ORCID. Form takes you to ORCID.org where you can create a new ORCID ID or link a previously added Tuhat ORCID ID. While doing this, you automatically allow UH to synchronize your data to ORCID. Note! If you should relocate, remove UH from Orcid.org -> Account Settings -> Trusted organisation. You are now back at your Tuhat profile page, do remember to press Save! After pressing Save button, you can open your profile and verify that the ORCID number is there. It will be also visible on your portal page. Create ORCID-ID directly at orcid.org. Copy paste this ID to your email and send it to Tuhat-info for submission. This submission does not activate the content export. Portrait will be shown in both new and old portal, but Curriculum Vitae added here as file and research related photo are only visible in the old portal (example). Add links to your other homepages. Links are shown in the new portal as icons below your portrait. Use link type to use specific icons for Facebook, Twitter and LinkedIn. Texts should be short and tight to maintain webpage readability. Affiliation information is mainly synchronized from other University systems, these are marked with . If this information is incorrect, please contact your personnel office or student registry. Tuhat customer service handles affiliations that are marked with . If this information needs correcting, please contact tuhat-info@helsinki.fi. Education together with professional and other qualifications are added here. 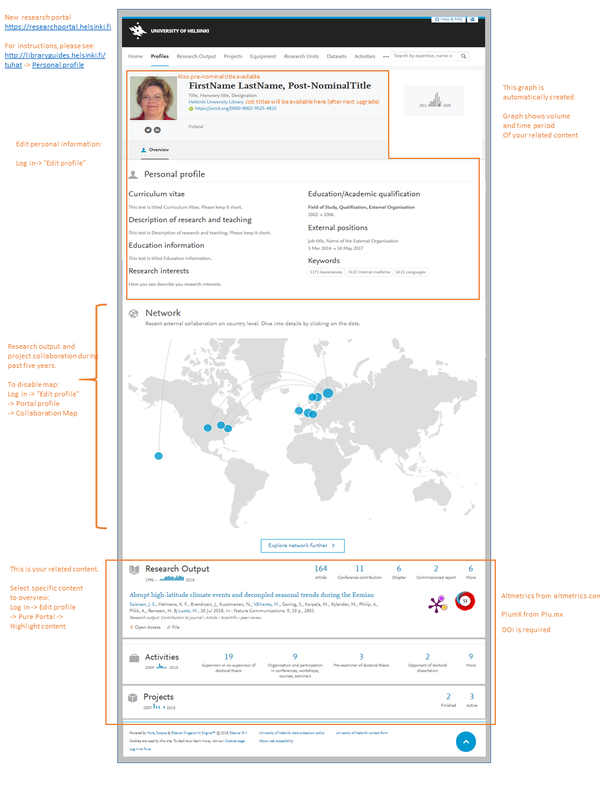 Visibility opens or closes person profile in the research portal. By default all profiles have Public visibility. Researcher may change this. Also only active persons are shown in the new portal. Public - No restriction = Person profile is open to Internet if person also has active affiliation. UH network = Currently not applicable. This option was used in previous portal. Portal profile (subsheet) allows modification of organisations and related content for portal overview page. Select which affiliations are shown in your portal overview page..
Fields of Science: Ministry of Education collects Fields of Science information on all research and teaching staff -> Edit profile -> Fields of Science. ORCID ID: is open researcher identifier and it enables linking research information across platforms. University of Helsinki follows ORCID-ID's to monitor open science -> Edit profile -> ORCID ID. Projects describe your ongoing research. The module "Projects" can be used to present long or short term projects, projects can have hierarchy and be related to each other. Other content types; e.g. funding (awards module), publications, datasets, research infrastructure, can be linked to projects. Projects are submitted manually. Funding (awards) data is synchronized every night from the financial system (more details below). Add name and write description, add/remove dates, persons and other information. Create relations to other content. Keywords. First select Field of Science and then add free keywords. Please see instructions here. Research funding data is in the Awards (funding wbs) module. Data is synchronized every night from UH financial system and its visibility is set to Confidential (only visible to researchers linked to this award and Pure Administrators). You may change this visibility to public. Project can be linked to one or more fundings. Also funding in other organisations can be linked (first create this funding in the Awards module, then link it to project). You can set the portal visibility of your and your co-workers projects and awards. All persons who are linked to a project and its awards have this access. To show awards in the portal, both the project and award need to be visible. Visibility is set at the bottom of project and award content forms. National publication data collection instructions for researchers are available here. OF NOTE: At the end of the instructions, you’ll find the list of fields that are mandatory for a publication added to Tuhat; e.g., field of science is mandatory as well as ISBN or ISSN number for publication types A-, B and C.
All publications can be added to Tuhat as "Research output", all types of publications with any affiliation are welcome. Only publications created at the University of Helsinki are linked to University's internal organisations, other publications get external affiliations. A new publication classification was implemented to Tuhat in October 2017 , please read more here. Publications are self-archived into University’s publication archive to ensure long-term access. Submission instructions are below. More information on self-archiving is available here. University's Principles of Open Publishing are available here. To create a publication to Tuhat, please create a template (form) for your publication. Templates are type-specific, please see article template here. Click the green button, top right corner. Create from template is for manual submission -> Select research output type -> A template opens. You have now created a research output template and should add meta data. Please go through the form and provide as much information as possible. 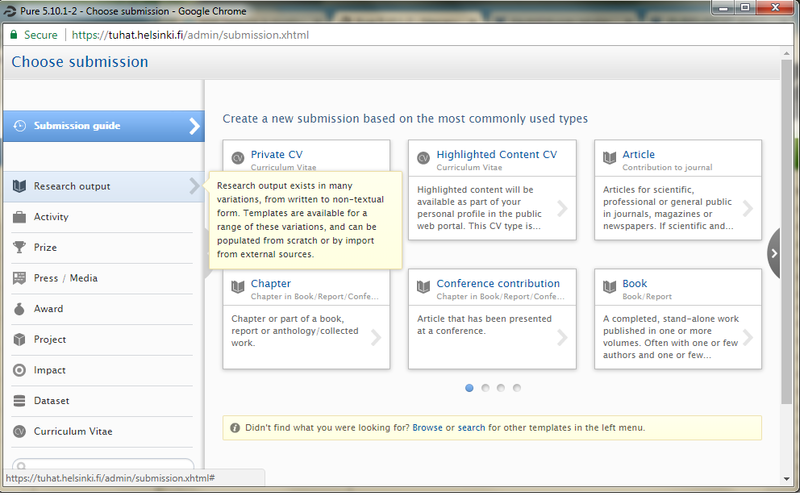 During template creation (above) you have selected general publication type. To further define the Ministry of Education publication type, please select "Scientific", "Professional" or "General" and then "Peer-reviewed" or "Not peer-reviewed". Latter option is only available for Scientific Publications. System will then select correct Ministry of Education type. See the full publication type mapping here. Add external organisations and authors with country information. This data is used for international and private company collaboration classifications for the Ministry of Education reporting. Open Access and other electronic versions; files and links. Open Access is reported as parallel publishing and as links that are openly available. Publication should be available openly without login or other dedicated access. Choose type. Electronic version can be file, DOI or other link (preferably permanent link). Select Upload an electronic version to create a self-archived publication into University's Open Repository HELDA. Depending on the archive policy of the journal, you have different rights to create a self-archived version of the publication. 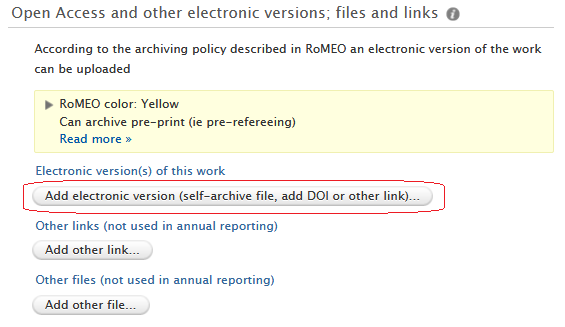 This archive policy is visibile in the publication template as RoMEO color (see picture above, text with yellow backround)) as soon as the journal from Tuhat database has been linked to your publication. If RoMEO -information is missing, please check your publishing contract. As soon as your publication has been approved by librarian, and the embargo date has passed, the file is transferred to HELDA. Read more on self-archiving here. And/or further Add link to an electronic version. Add permanent identifiers (URN, handle) or other links here. Please note that in national reporting only permanent links are accepted. License (read more info on licensing here). Keywords -> FIELDS OF SCIENCE. se as specific fields as possible. Ministry of Education and Academy of Finland use field of science for university comparisons. This sets Where the content can be seen. Backend - Restricted to Pure users,only visible when logged in to PURE. Confidential - Restricted to associated users and editors, only visible for persons associated with the content and also administrators. N.B.! Publications marked as confidential are not included in reporting. Check "Status" at the bottom of the template. "For approval" indicates that this publication is ready for validation process (library). To keep this publication at your personal use, please select “Entry in progress”. Other scientific output and interaction with the society are submitted as activities. Press/Media information is submitted to Press/Media module. It is recommended to keep activities updated regularly. Visiting external organisation and hosting a visit that last 5 days or longer are reported to Ministry of Education and Culture. As societal impact it is recommended to use classifications marked with an asterix*. Visits only include research or teaching visits to/from foreign universities, universities and research organizations (including companies)). For example, participation in a conference is not counted as a visit. Information is collected per visit. One person can have multiple visits per calendar year. The visit is marked for the calendar year in which it has begun. The travel dates are counted on the work day. To add "Visiting an external institution"
Add visited organisation and its country: Create new organisation (preferred) or use the Search (this data is not curated). Only use the top level name (e.g. University of Oxford), no subunits. Add duration: start and end data. Use Period of Time -field (see the red box in the template picture). Visits 5 days or longer and by research or teaching staff are included in the Ministry of Education and Culture annual statistics. The length is calculated using both Visit start date and End date. To add "Hosting a visitor"
Add visitor: both visitor name, visitor's home organisation and country are added. Create new person and organisation (preferred) or use the Search (this data is not curated). This module captures mentions of you in Press and Media. Mentions can be bundled together as a theme or story (e.g. all mentions of one scientific article are collected to one theme; this is new feature introduced Dec 2016). Information can be submitted manually or synchronized from NewsFlo using your Scopus Author ID (add Scopus Author ID to your personal information). In Details of Media Contribution and Media Coverage you can add one or more mentions of same theme/story. Here you also provide dates and link your colleagues. Add relations to other Tuhat content and fill in the rest of the fields. Impact definition is available in the Academy of Finland guidelines concerning impact beyond academia (April 2017). Impact is a new module in Tuhat and it currently only used by the University in the reporting of three-year research grants. Data from Impact module is not used in 2018 Research Assessment. Research impact is described using narrative text and classifications. Impact is then linked to publications, projects, datasets, research infrastructures etc. Add relations to publications, projects, datasets, research infrastructures etc. Is placed on the third or fourth level in the hierarchy of research positions. Go to tab "Principal Investigator". Tick box that says "I would like to submit....". Select organisation. This application is then evaluated according to your Faculty policy and the decision is submitted to Tuhat. This process is managed by research administration advisors, see link below. Scroll down the form and view "Qualifications". Research groups and other research communities can be created to Tuhat as organisations. Research group leader should be a Principal Investigator at the University of Helsinki. Creation of research groups in the research information system increases web visibility and enables reporting: research group members and their content (publications, projects, activities) are linked to the group which then enables visibility services and reporting. Please send an email to tuhat-info@helsinki.fi with the following information. Also note that with this email you commit to keep research group information up to date, including person list. Library will then create the group with research group members and their related content (publications, projects and activities). This will take some weeks. Login to tuhat.helsinki.fi and navigate to Master data -> Organisations. Open organisation template. Add description and link. Also other information can be added. Publish group information in the research portal by changing "Visibility" = Public. To view related content, go to subsheet Relations, check linked data. If incorrect, please contact tuhat-info. Future data is automatically linked to group during data submission process. New memebrs are added by tuhat-info@helsinki.fi. Please create a new email (new service ticket) with group name, email address of new person and start date. Research group will automatically get a web page in the research portal. Separate more visual web pages can be created with the University's Drupal publishing tool, please read more here. Research groups and other research community organisations are created in Tuhat, see instructions above. Othewise the organisation hierarchy is the same as in University's organisation registry. Organisation editors can modify following information in Tuhat. Log in to Tuhat -> Go to Master data -> Organisations -> Open organisation template. Name versions. Organisation web name is shown in the portal overview page. Mostly Tuhat uses the organisation registry data. IDs. If your organisation has PlumX profile, add your organisation's PlumX abbreviation to "Organisation ID". This will add Plum Print widget to organisation's portal page. Example. Photo is published in the portal. Electronic Address. Regarding web addresses, please fill in all language versions so that links are available in Tuhat portal's EN, SV and EN versions. To get organisation editor privileges, please contact tuhat-info@helsinki.fi.